Follow the indications for Fiera/Verona Centre. Continue along Viale delle Nazioni, and Viale Piave. When you arrive at Piazzale Porta Nuova turn left. Drive down Viale Luciano Dal Cero. Continue until Porta Palio. At the roundabout/traffic circle turn right until the traffic lights, and then continue straight on down Corso Porta Palio. After the second set of lights drive down Corso Castelvecchio and Corso Cavour. (you will see the castle on the left). At the end of Corso Cavour, in front of an ancient Roman gate, Porta Borsari, turn right into via Antonio Cantore and drive to the end of the street. Then turn right into via Alberto Mario. Further on turn right into via Gugliemo Oberdan, and then immediately left into via Carlo Cattaneo. After a short distance you reach via Teatro Filarmonico on the left, that takes you directly to Hotel Europa. Join the ring road in direction “Verona Centro”. At the end of the ring road turn left and continue towards Porta Palio. At the roundabout/traffic circle drive right until the lights, then straight ahead into Corso Porta Palio. Bus numbers 11, 12, 13 or 510 to the centre, stopping at Piazza Bra. Via Roma is a pedestrians only street that connects Piazza Bra and Castelvecchio. As you enter the street from Piazza Bra Hotel Europa is fifty metres on the right. 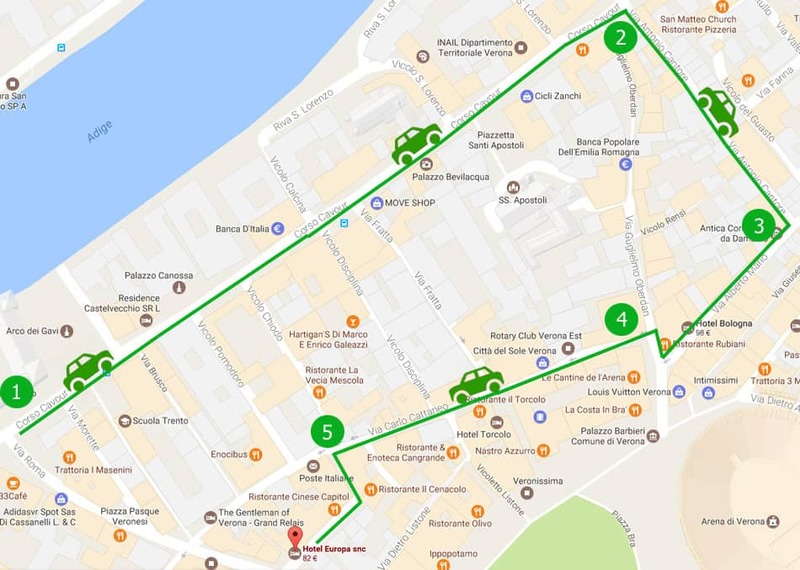 Bus numbers 21, 22, 23, 41, 61 for the city centre, stopping at Castelvecchio. 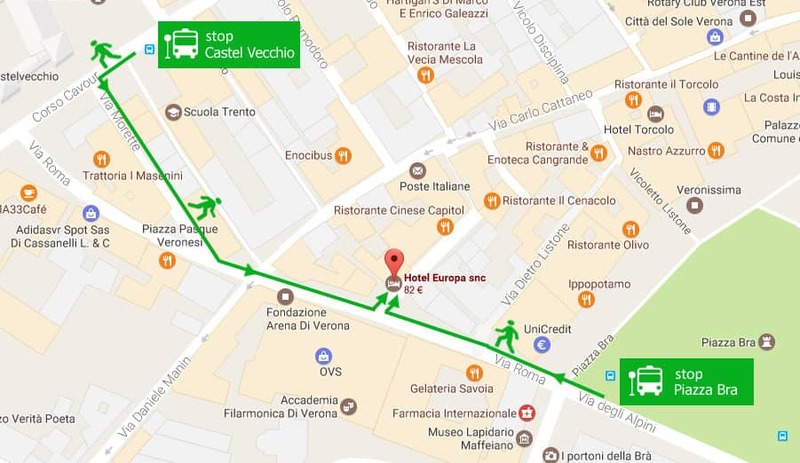 Via Roma is on the right hand side of Castelvecchio bus stop and Hotel Europa is about 150 metres from Castelvecchio. A shuttle bus service is available, connecting the airport to the station in 15 minutes. The service departs every 20 minutes. For timetables consult the site http://www.atv.verona.it.